Get City Night Line overnight train tickets to Germany, Denmark, Austria, the Netherlands, Switzerland and many more European destinations here. Sleep while you travel and save on hotel fees as well as daylight when you wake up fresh and ready for your business or leisure at your destination in one of Europe's city centers. Travel and dream on board your high speed night train service through Zurich – the Swiss metropolis, Paris – city of love and fashion, Milan – more than just a “gateway to the world” and many other cities in Europe like never before... early, well refreshed to start your day. Book your City Night Line Tickets online here and start of on your trip. With single, double, or triple sleeper carriages, you decide how much you are willing to splash out. Get to Europe while others are sleeping. You can have a full shower cubicle, toilet, and a bespoke lounge to yourself, overlooking a panoramic view as a single deluxe passenger or share facilities with other passenger as you travel in the City Night Line train to Europe and save money. If you choose to travel in the couchettes, you get sleeping duvet and reading lamp, and then use a common toilet and wash room at the end of that section of this night train. Looking to book a female couchette? You can do so up to two days before departure to ensure availability and security. Reclining seats are also available on some services and sections of the CNL trains. 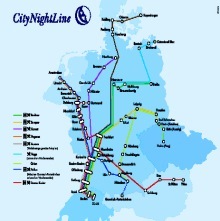 If you are planning a trip across Europe then get on the CNL popularly known as Berlin City Night Line trains. Visit charming cities in Europe, rich in arts, architecture, culture and steep in history. Master the routes. You could be waking up in any of the following city's city centre on one of these night trains across Europe. Munich to Rome in 12 hours. Enjoy the changing views of well lit European cities like you've never seen before while dinning aboard the CNL rail. This high speed rail has a special restaurant car, meeting desires of your stomach. You can pay for your dinner separately if you want to, if traveling on couchettes and reclining seats. For Deluxe and Economy travelers, the cost of dinners is included in the ticket price... meaning you get dinner for "free" on your journey. So be sure to look out for the dinner time and don't miss out on this. You will have a great selection of continental and local meals to choose from. If you are traveling in a service without a restaurant car, snacks are provided. You may have dinner in bed. Yes. You will be served like a kind or queen. You can book a city night line rail reservation online. Links serviced includes the Amsterdam to Milan route, Munich to Paris, Basel to Prague, Berlin to Bolzano, Munich to Copenhagen and many more. Enter your departure point in the row provided and then choose your destination. 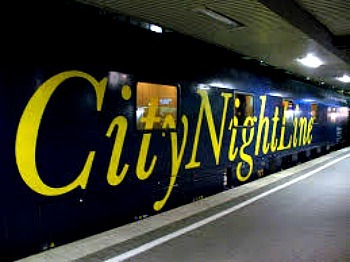 You will get the option to book your city night-line train. Are you an invalid or disabled? You have disable access on this night line train. While dogs attract a fee on the carriages, most luggage go free. Have a bicycle, a standard free of £6 to £10 is charged. Guide dogs and Assistance dogs travel for free in all types of accommodation. Make sure you enjoy your trip aboard the CNL to any of your chosen destination across Europe.